The Round Lake Area Exchange Club Hometown Hero Committee and sponsor, Linda Snelten, COO of NICASA are proud to announce U.S. Marine LCpl Anton Salomon as their November hero. Salomon a supporter and volunteer for the Grayslake/Round Lake Relay for Life and was registered at the Clubs site, www.rlaexchange.org/hero, by his mother, Janet. According to Hometown Hero Project Chair, Sherry Ridge, Salomon’s “Hanging with the Heroes” care package will be filled with beef Jerky, Tic Tacs, cheese snacks, gum and other goodies. Also included with the generous sponsorship of NICASA, COO, Linda Snelten will be special requested items of IPod ear buds and socks. All “Hanging with the Heroes” care packages are delivered with a personalized “Hanging with the Heroes” t-shirt (donated by Artrageous of Hainesville), a piece of home and letters from Round Lake Area School District 116 students. 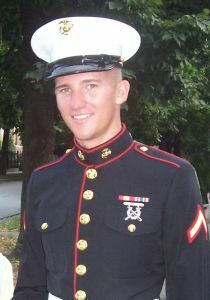 The Club will present a plaque on behalf of the November Hometown Hero to his family at their meeting on November 23. The meeting is held at Panera Bread in Round Lake Beach, 7:30 a.m. and is open to the public.